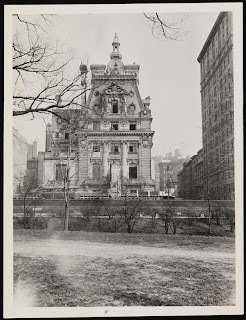 The William A. Clark residence designed by Lord, Hewlett & Hull and Kenneth Murchison c. 1905 at 952 Fifth Avenue in New York City as seen during demolition in 1927. Click HERE and HERE for more on the William A. Clark residence. 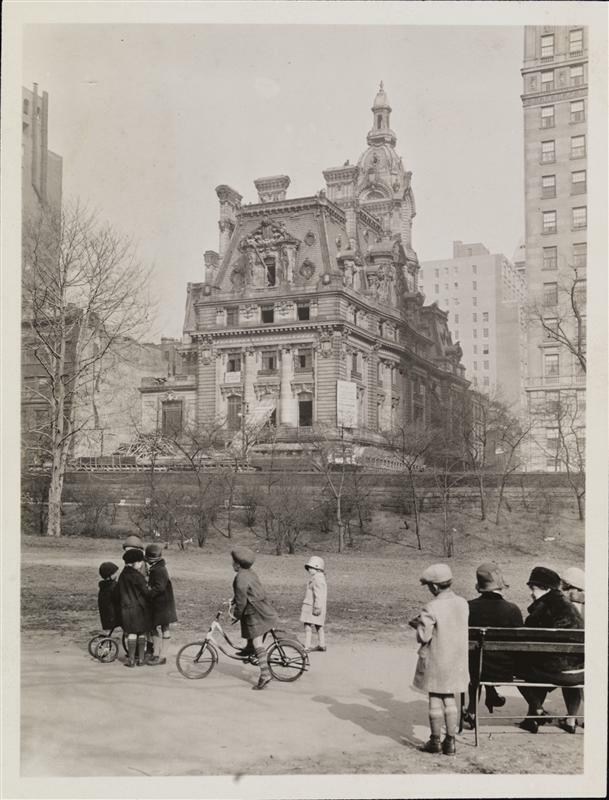 Photos from the Museum of the City of New York. What a wonderful photograph. And once again, what a wild, out-of-control building---everything but the kitchen sink in that design. You so rarely see a demolition photo, I love this. I've also never seen the house from this angle or in context (only straight on). It was really a bit over the top! I knew I had a second demo photo somewhere and I found it and posted it. Looks like it definitely could be. That fourth floor looks like it's a good 50-60 feet high. Despite the "scholarship", it was indeed an astonishingly ugly house -- and should have been preserved for that, if nothing else. Author Wesley Towner, in 'The Elegant Auctioneers', of 1970, wrote . . . "In 1925 Senator William A. Clark had died at the age of eighty-six. Thirty thrushed-voiced choirboys trilled his $77-million soul to rest. His funeral, like his life, was a superspectacle. From the bowels of the 121-room mansion that was to outdo all other mansions the colossal organ wailed and sang and whined. Its sixty-five stops all lent their sirupy voices to the wild-haired, brazen Copper King's send-off. The great organ bawled and brayed; the choir organ swelled and sobbed and twittered; its tremolo stop full out; the echo organ magnified the caterwaulings; the thirty-one combinations united all the pipes in one last earthly blast; the twenty-three couplers brought the manuals together in a peal of lamentation that may well have given God-fearing residents of Fifth Avenue the impression that the Day of Judgement was at hand." Wesley Towner further wrote . . . "The Senator had held court for only thirteen years in the house that took thirteen years to build. 'Should its rooms come to be recognized as better than its company, it will be correspondingly costly to demolish,' Architectural Record had said. 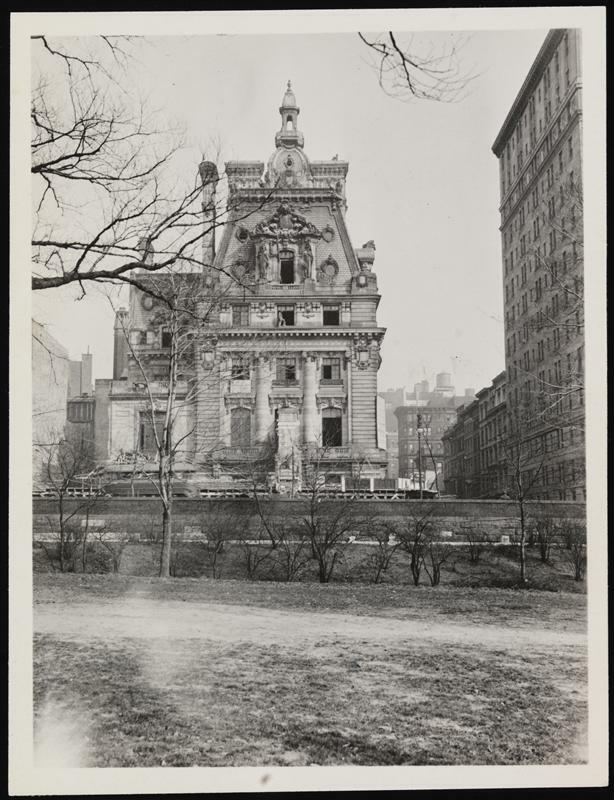 Now, in The New Republic, spoilsport eulogist Robert Little wrote: 'The Clark house on Fifth Avenue is coming down. In a few days the Senator's palace will begin to chip and crumble away and be pried off with crowbars into dismembering trucks. Its fat corduroy ribs will sink down nearer and nearer to the sidewalk, with a click of bricks and puffs of plaster dust, until at last its $7,000,000 worth of minerals has become nothing but a hole in the ground, a hole full of rubble and loose earth and water. From the hole in the ground ~ by this time worth a great deal more than when the house stood upon it ~ steel girders will rise, and by the end of the year a respectable flat packing-box of an apartment house will have removed all trace of scandal.'" Stunning in its flamboyance, but a wonder to behold. A flat packing box is what they got in it s place no doubt. Were the floor plans of the house ever published - other than the ground and first floors? I've always wondered about the rest of the building. OGD -- That second post is especially wonderful. Zach -- Any idea of the photographer? Philip G. Bartlett is listed for both. This is unquestionably my favorite New York residence. What a spectacular tour de force! I am amazed at the hostile press. Do you have the back facade photo? Zach . Thanks so much everything on your blog, but I must tell you that the first photo of the Clark mansion, with the children is a favorite of mine and evidently a big hit on Pinterest as 33 people have repinned it. Does anyone have any idea how large this house was? How much square footage?